Dallas’ Gemel Smith, left, and the Blue Jackets’ Markus Hannikainen chase a loose puck during Tuesday night’s game in Columbus. Dallas’ Miro Heiskanen, left, and the Blue Jackets’ Artemi Panarin fight for a loose puck during Tuesday night’s game in Columbus. 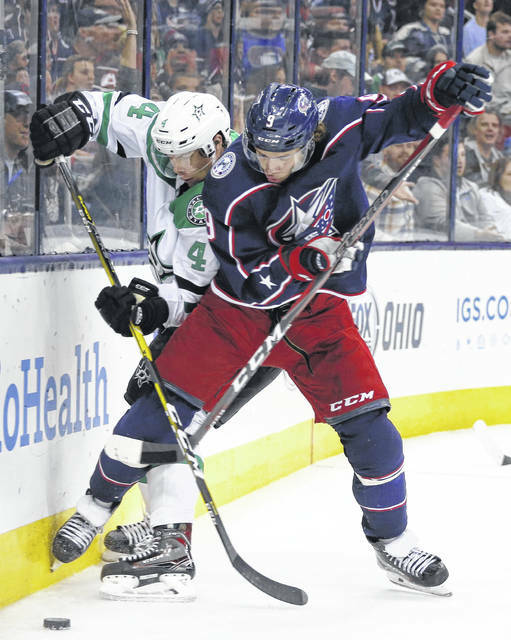 COLUMBUS — Sergei Bobrovsky made 27 saves to lift the Columbus Blue Jackets over the Dallas Stars 4-1 on Tuesday night. Bobrovsky, who has struggled lately, played one his better games this season, capping it by withstanding a 6-on-5 surge after Dallas pulled Bishop late in the game. Nutivaara made it 2-0 with his second goal of the season in the middle of the second period, a one-timer from the right circle off a slick cross-ice pass from Artemi Panarin. Foligno rocketed a one-timer over Bishop’s shoulder from the left dot late in the second to give the Blue Jackets a two-goal lead. Notes: Columbus has beaten Dallas six straight times. … D Dean Kukan replaced Scott Harrington in the Columbus lineup. F Lukas Sedlak replaced Oliver Bjorkstrand. … Dallas forward Brett Ritchie missed his second straight game due to an illness. D Marc Methot missed his third game with a lower-body injury. F Alexander Radulov missed his fourth game with a lower-body injury. … Jenner has three assists in the past three games. … Bobrovsky is 11-1-1 against Dallas in his career.